Eat Is Taco Bell About to Launch Fritos Tacos? Is Taco Bell About to Launch Fritos Tacos? Wild speculations based on a recent investors' meeting make us think so. Fritos lovers, Taco Bell aficionados, countrymen, listen up. There might be a Fritos Taco making its way onto the Taco Bell menu. During a presentation to investors on Thursday, Taco Bell’s parent company Yum! 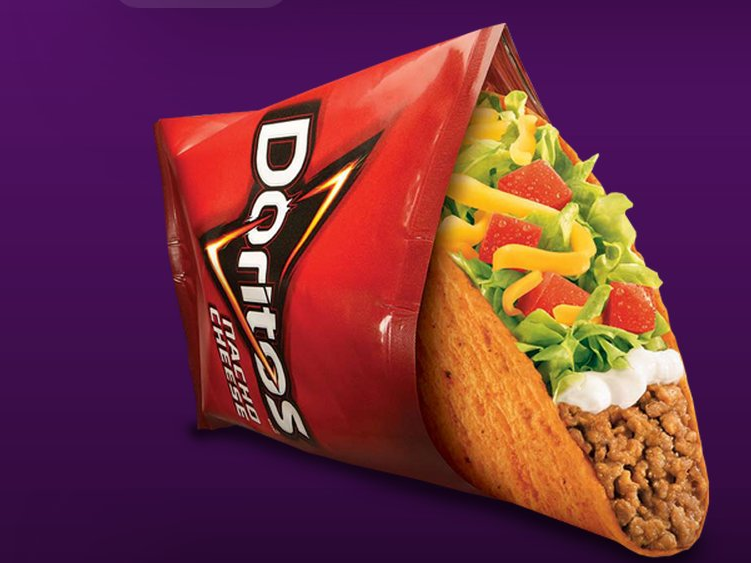 Brands slipped a photo of a hard taco inside a Fritos bag (see above) in their slideshow, Business Insider reports. The illustration is very similar to the one that Taco Bell uses to represent the Doritos Locos Tacos on menus and ads. Introduced in 2012, the Doritos Locos Tacos has a shell made of Nacho Cheese Doritos chips, and it’s Taco Bell’s most popular menu of all time. “We’re always innovating and testing new concepts,” a TacoBell spokeswoman told Business Insider when they pressed for further clarification. Innovation has been a huge component in Taco Bell’s investments: this year, the company added a breakfast menu, which features items such as the Waffle taco, in which scrambled eggs, sausage, and cheese are wrapped in a warm waffle. A Beefy Fritos Burrito is also a recent introduction: it consists of a beef-filled burrito with cheese, rice, and Fritos. Will the Fritos Taco, if introduced to the menu, be able to compete with the Doritos Locos Tacos? Only time will tell.